When an emergency occurs, it’s important to let everyone know they need to seek safety as quickly as possible. That’s why Cisco and Singlewire are making it easier than ever to set up two key safety features of InformaCast Advanced with the release of CUCM 11.5.3. 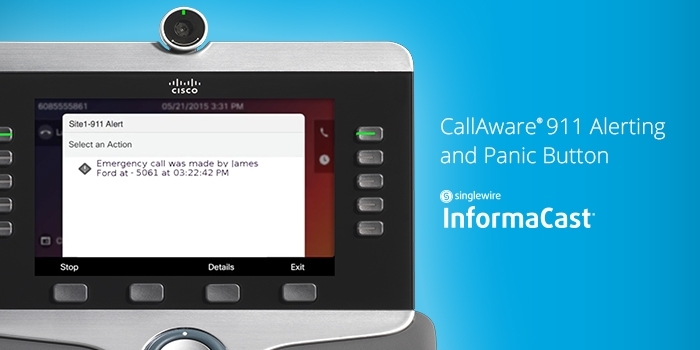 With InformaCast emergency notification software and Cisco IP phones, users can set up a panic button right on their desk phones. The panic button can be configured to send text and prerecorded audio to specific security personnel or throughout an organization, with the simple push of a button. 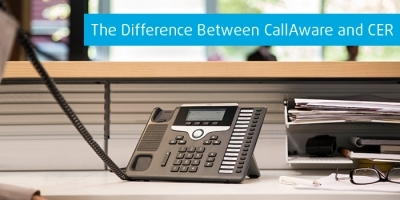 The new integration with CUCM 11.5.3 also makes it easy to set up InformaCast CallAware. This feature sends an alert anytime 911 (or any emergency number) is dialed on a Cisco IP phone in an organization. Often people in an organization are not aware an emergency occurs until an ambulance shows up on their doorstep. With CallAware, the people who need to know, get the information they need to help keep people safe. CUCM 11.5.3 makes it quick and easy to set up these safety features on Cisco IP phones because the panic button and CallAware configuration is included in the CCM Admin interface. That means you don’t need to worry about logging into another system to set up the safety features you need. Keeping your people safe is a top priority, and you want to make that process as easy as possible. Using a wizard-like setup process, in a few minutes you can have panic buttons and InformaCast CallAware configured on phones throughout your organization. 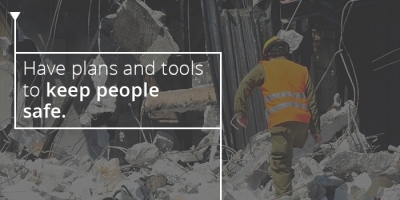 This empowers everyone in your organization to help spread the word when an emergency occurs. Singlewire Software will be talking about this upcoming feature and the latest developments to its InformaCast emergency notification software during Cisco Live in Las Vegas. Find us at booth 720 where we will be demonstrating our other Cisco integrations that help keep people safe and informed in your organization. See our Cisco Webex Teams integration, which brings together key stakeholders in an incident response space for emergency situation management, and try our InformaCast Command Center, a new way to quickly send detailed emergency notifications for common crisis scenarios. Finally, be sure to take a selfie with our IT superhero in our booth to enter for a chance to win a helicopter ride for you and a friend over Las Vegas.